The annual Great Forest Park Balloon Race and Balloon Glow is approaching, and like previous years, it’s sure to attract thousands of visitors. Due to construction to Central Fields, both events have relocated to Art Hill in Forest Park. Even though the location in Forest Park has changed, one thing remains constant — Metro is your best way to get to all of the fun. If you’re making plans to go, park at any one of 21 free Metro Park-Ride lots in Missouri and Illinois, and take MetroLink or MetroBus to get to the festivities while avoiding heavy traffic, parking hassles and road closures. Metro will operate additional MetroLink trains as needed during the evening on Friday, September 15, to accommodate the large crowds anticipated for this year’s Balloon Glow on Art Hill in Forest Park. The Balloon Glow is scheduled from 7 p.m. to 9 p.m., with fireworks at 9:15 p.m.
You can take MetroLink via the Forest Park-DeBaliviere MetroLink Station or the Skinker MetroLink Station to get to the Balloon Glow. Both stations are about a half-mile from Art Hill. You can also use MetroBus to connect with these two stations. The #1 Gold and #90 Hampton MetroBus routes serve the Forest Park-DeBaliviere MetroLink Station, and the #1 Gold, #2 Red, #16 City Limits and the Green Line serve the Skinker MetroLink Station. The #90 Hampton will be on reroute during the Balloon Glow and Balloon Race and will not serve destinations within Forest Park. Note: Metro will not be operating special bus shuttle service to or from the balloon glow event. The Great Forest Park Balloon Race begins at noon on Saturday, September 16, at Art Hill in Forest Park. Ride MetroLink or MetroBus to the Forest Park-DeBaliviere Station or the Skinker MetroLink Station and walk to the race grounds on Art Hill. Note: Metro will not be operating special bus shuttle service to or from the balloon race event. 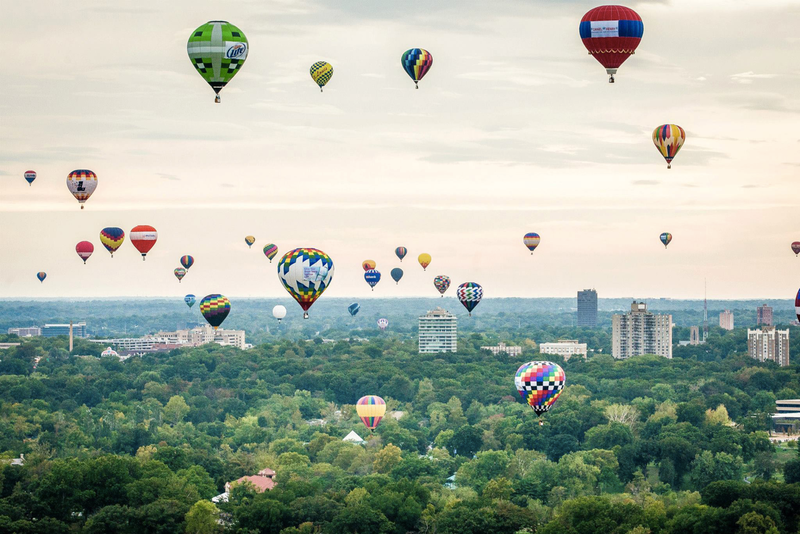 To plan your trip to the Annual Great Forest Park Balloon Race or Balloon Glow, download the Metro On The Go app, use the online TripPlanner, or contact Metro Transit Information, Monday through Friday from 7 a.m. to 6 p.m. at 314-231-2345 or 618-271-2345. Can you correct the event dates for the Great Forest Park Balloon Race? We’d love to share with the GFPBR attendees. It’s Friday, Sept. 14th and Saturday Sept. 15th Thank you! Tiffany, we are planning to publish a blog about this sometime next week, which will have the updated dates.